My daughter asked for a skate board for her 8th birthday. Since we've already dealt with her breaking bones while playing, we weren't enthralled with the idea of her standing on a wooden board with slippery wheels underneath it for her to fall off of and break something else. Unfortunately, our neighbors (who are really, really great neighbors) didn't have the same level of caution we had in regard to skate boards: they let their kids ride them. 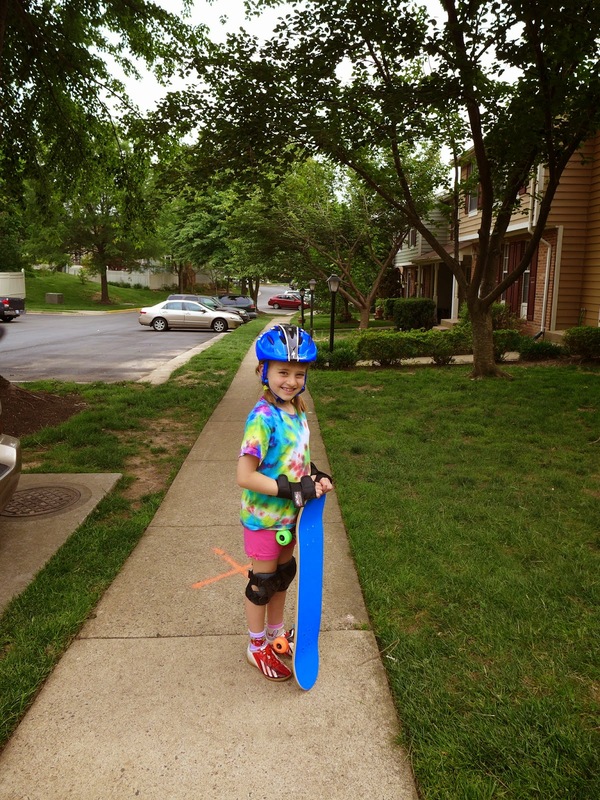 So, our daughter kept trying out the neighbors' (cheap) boards, and she loved them. So, we did a little internet research and found out that skateboards are dangerous, but they are less dangerous if they are well-made and sized right for the kid. 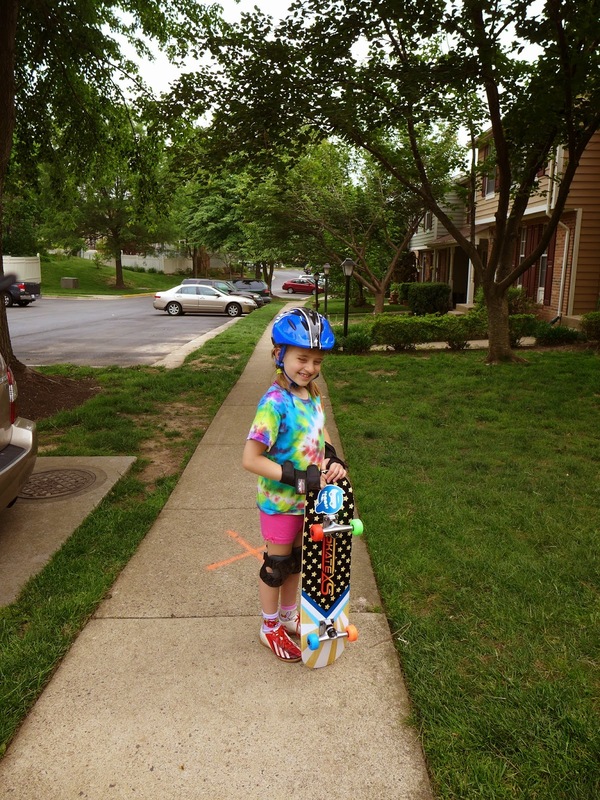 So, I email her uncle and said: "If you want to keep your status of coolest-uncle-ever, your niece would love a skateboard for her birthday. BUT, my research shows it needs to be a "good" board so please do your own research to decide what type of board she should ride to keep her safe." Then, he writes me back and says: "What I'm proposing is this: SkateXS. It's a board specifically designed for kids ages 8-10. It's made from bamboo so it's a renewable material. SkateXS got good reviews from other websites I browsed, and everything I've read says 'cheap skateboards are c***.' This SkateXS board qualifies as not cheap, in all the good ways. The bottom of the board is pretty but benign, which isn't the case for many of the boards I looked at with graphics I didn't care for." A month later her custom skateboard arrived in the mail in a bland brown box so that she didn't know what was waiting on the front porch. Her uncle had checked ahead with them to make sure the birthday surprise wouldn't be ruined by the box! On her birthday, she opened it and LOVED it. She hit the pavement shortly afterwards and took to it right away! She held on to me for a few runs, but overall, she was a natural. I attribute her easy transition to all her years on the mini-micro kick and maxi-micro kick scooters. A few days later, I emailed SkateXS and asked if a light-weight adult could ride on the board (which they can) and received a very fast, informative, and kind email in return! Safety: well, safer than a poor-fitting, poorly crafted big-box skateboard, but it is still a board on wheels so wear safety gear! (NOTE: All opinions are my own and I am in no way affiliated with SkateXS).